The term ‘floor system’ is often used when referring to a developed procedure that contains a certain set of steps with correct equipment and tooling to achieve a specific finish. These systems are often designed with multiple variations to give contractors choices and options to deal with ever changing site conditions. Big or small, our system has something for every project and budget. The term ‘floor system’ is often used when referring to a developed procedure that contains a certain set of steps with correct equipment and tooling to achieve a specific finish. 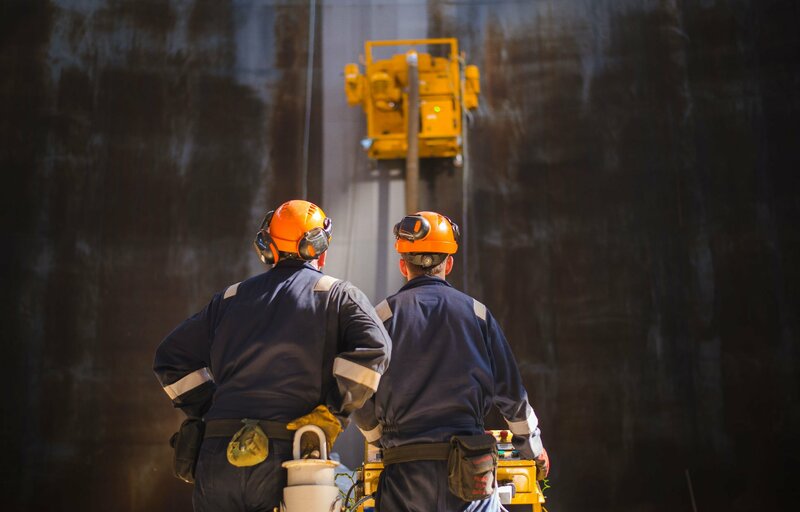 These systems are often designed with multiple variations to give contractors choices and options to deal with ever changing site conditions. The iSHINE concrete polishing floor system allows contractors to choose from 4 different finishes and from a variety of tools in order to delivery a high quality product. THE iSHINE FLOOR SYSTEM HAS BEEN DESIGNED WITH FOUR DISTINCT FINISHES TO ACCOMMODATE EVERY JOB. Big or small, our system has something for every project and budget. While it sounds simple initially, the tragic flaw with many of these floor systems is they are overwhelmingly complex and technical which makes them useless in practice. Thankfully, the iShine Floor System has been designed with the contractors in mind, in a manner that seeks to alleviate stress and confusion by establishing a straight-forward system that is easy to follow. In addition to being easy to use, the iShine Floor System is a superior solution that contractors can trust to give proven results. There are 4 different finishes within the iShine Floor System: Economy, Prestige, Elite, and Ultra-Elite. These four finishes differ from each other in terms of time, cost, and appearance. With four unique options, price points, and final outcomes, it is very easy to choose the custom finish that will best suit each job, instead of a one-size-fits-all finish. 1) To GRIND or not to GRIND? If your desire is to show off the beautiful aggregate that exists within a concrete floor, you will want to choose either the Elite or Ultra-Elite finish. Both of these finishes utilise the initial grinding steps to expose the aggregate within the floor. On the other hand, if you do not want to expose aggregate or your desire is to achieve a ‘salt and pepper’ look, you will want to choose either the Economy or Prestige finish. 2) What kind of gloss are you looking for? Regardless of whether or not you want aggregate, you’ve got the option to choose a low or high gloss finish with the iShine Floor System. The Economy and Elite produce a low gloss finish, whereas our Prestige and Ultra-Elite produce a high gloss end product. Once you know if you desire a low gloss or a high gloss, you’re one step closer to determining which finish to go with. If getting the job done quick is your most important factor, the Economy finish is the quickest option available. If you aren’t in a mad rush and can take a little more time, both the Prestige and Elite finishes are the mid range products. (although your stance on aggregate will help you choose which of the two you want to go with). 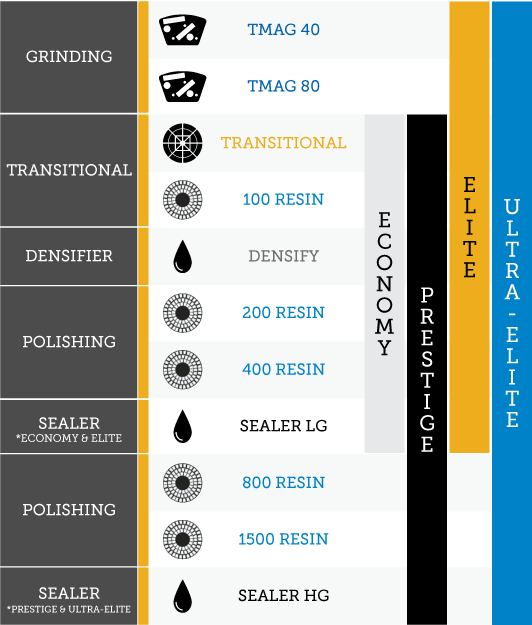 And finally, the Ultra-Elite is the finish that has the most number of steps as it includes the grinding steps to expose the aggregate as well as the final polishing steps to give that high gloss finish. Don’t let the length of the process scare you; the end result is worth the wait (or investment). Often, money is the deciding factor on a job. The Economy is our most budget-friendly finish, with the Prestige and Elite being our mid-range options, and the Ultra-Elite is our high-end finish, making it most costly, but well worth the investment if the job is suited for this pristine look. As you can see, there are a lot of different options to consider when trying to figure out which finish to go with for a certain job. In a follow-up post, we’ll examine finish profiles and explore what they look like in practice. There we’ll walk through parts of the process and get you one step closer to the finish you’re looking for. Rest assured, you’ve come to the right place. The iShine Floor System is the superior solution for concrete floors.